International Lunar Observatory-1: Making Moon South Pole Astronomy and Communications a Reality – Steve Durst, Founding Director, International Lunar Observatory Association, Editor and Publisher of Space Age Publishing Co.
ILO-1 Moon South Pole: A new frontier as exciting and enriching as Humans on Mars or trillion dollar asteroids, and much closer in space and time. Pursuing a series of Moon-based observatory missions to complement Earth-based and Space-based astronomy, ILOA seeks to advance Galaxy Imaging for 21st century astronomy education with its ILO-1 primary mission 2-meter radio antenna to Malapert Mt. 86°S 2.7°E near the Moon’s South Pole, with an ILO-X precursor mission aboard a GLXP lander, and with a Human Service Mission to the ILO-1 / robotic village new world frontier. ILOA is also collaborating with the National Astronomical Observatories – Chinese Academy of Sciences (NAOC) Lunar Ultraviolet Telescope (LUT) at Mare Imbrium 44°N 20°W aboard the China Chang’e-3 Moon Lander, the first spacecraft to land on the Moon in almost 40 years and the only spacecraft operating on the lunar surface. Conducting science-driven and education-based Astronomy from the Moon via LUT is a foundational success of international cooperation on which the ILOA intends to build. More than 40 years since the Far Ultraviolet Camera / Spectrograph operated on the Descartes Highlands by NASA Apollo 16 Commander and ILOA Board of Director Emeritus John Young in April 1972, ILOA is drawing together resources from across the planet to reclaim the cosmic revolution of Humanity as a Multi World Species. The 7th Edition of ILOA’s stellar “Galaxy Map” is now being distributed to high school teachers and other educators around the world, designed for use in every class with maps of the world and Solar System. Large optical telescopes on the Moon – Paul Hickson, Professor, Department of Physics and Astronomy, The University of British Columbia. The Moon offers some unique advantages for future very-large optical telescopes. The airless environment, slow lunar rotation and precession would enable a zenith-pointing telescope, located near one of the lunar poles, to survey a large region of sky and study the epoch of galaxy formation. I will present results from a recent NASA/CSA study that considered the feasibility of lunar liquid-mirror telescopes having apertures in the 20 to 100 metre range. I will describe efforts here on Earth to use custom-designed radio observatories to measure the history of accelerated expansion of the Universe in order to improve our understanding of dark energy and to measure the signature of the reionization when the Universe first made stars. Both of these experiments are severely limited by man-made radio interference and would be more sensitive if carried out on the moon, but both of them require football stadium sized telescopes, so building them on the moon would be a very serious challenge. My research interests in archaeology include palaeoIndian research, communal hunting and northern plains archaeology and archaeoastronomy. I have a strong interest in traditional knowledge and I look for its meaning and significance to better understand the archaeological record. I contend that traditional knowledge has much to offer archaeology as a method for identifying archaeological sites and for interpreting sites that lack artifacts. I see traditional knowledge as a system of knowing about the environment and I investigate it within the context of ethnoscience. The Canadian Space Society (CSS) is a national non-profit organization made up of professionals and enthusiasts pursuing the human exploration and development of the Solar System and beyond. Its principal objective is to stimulate the Canadian space industry through its technical and outreach projects and promote the involvement of Canadians in the development of space. With many of Canada’s top space professionals on board, the CSS is made up of people of all backgrounds and interests, including teachers, environmentalists, writers, and marketers. Our principal objective is to sponsor and promote the involvement of Canadians in the development of space. International Lunar Observatory Association (ILOA) is an interglobal enterprise incorporated in Hawaii as a 501(c)(3) non-profit to expand human knowledge of the Cosmos through observation from our Moon and to participate in internationally cooperative lunar base build-out, with Aloha – the spirit of Hawai`i. The ILOA co-sponsors with its Space Age Publishing Company affiliate an international series of Galaxy Forums to advance 21st Century Education. Galaxy Forums, designed to provide greater global awareness, capabilities and action in Galaxy science, exploration and enterprise, are held in Hawaii, Silicon Valley, Canada, China, India, Japan, Europe, Africa, Chile, Brazil, Southeast Asia, Kansas and New York. Current plans are for expansion to Antarctica and beyond. Galaxy Forum Canada 2014, with the theme “Moon South Pole and Human Missions: Giant Steps into the Galaxy” was held in conjunction with the 65th International Astronautical Congress at the Metro Toronto Convention Centre in Ontario, Canada. Thousands of scientists, engineers and experts from around the world gather to explore the latest achievements, innovations and ambitions of worldwide space agencies, industries and enterprises. The Moon’s South Pole is as exciting and enriching a new frontier as humans on Mars or trillion dollar asteroids, and much closer in time and space. The distinguished international, national and independent experts assembled for the event consider how robotic missions 2016-2018 can function as precursors to Human Moon missions in the 2020s. A fusion of astrophysics and astronautics, the ILOA Galaxy Forum will preview upcoming Luna missions and priorities of major spacefaring powers China, India, Russia, USA, Europe and Japan, as well as Canada, Korea and others; and of the remarkable enterprises at the forefront of the commercial Lunar Renaissance. The International Astronautical Federation (IAF) is an official co-sponsor for Galaxy Forum Canada 2014 and is providing a plenary hall at the IAC venue for the event. Galaxy Forums are free and open to the general public. More information about the program will be available soon. If you have any questions, please contact info@iloa.org. Galaxy Forum Canada 2013 with the theme Human Moon Missions: Giant Steps into the Galaxy brings together Leaders and Innovators working on projects to extend Human exploration and enterprise to the Moon. These steps toward Galaxy / Solar System competence will bring great opportunities and rewards not only for those who choose to push boundaries on the Space frontier, but for everyone on Earth. Canada has much to contribute — in addition to proven success innovating extremely effective space systems and robotics, like the well known and much loved CanadARM, Canadian Astronaut and ISS Commander Chris Hadfield has very successfully conducted on-orbit science, education and outreach. Galaxy Forums are free public events designed as flexible and responsive solutions to advance Galaxy 21st Century Education. Specifically geared towards high school teachers, educators, astronomers of all kinds, students and the general public, presentations are provided by experts in the fields of astrophysics / galaxy research and 21st Century Education. Interactive panel discussions follow and efforts are made to integrate local perspectives and traditional knowledge. Galaxy Forums have been held in Hawaii, Silicon Valley, Canada, China, India, Southeast Asia, Japan, Europe, Africa, Kansas and New York. The ILOA is an interglobal enterprise incorporated as a non-profit in Hawaii to advance human knowledge of the Cosmos through observation from our Moon. 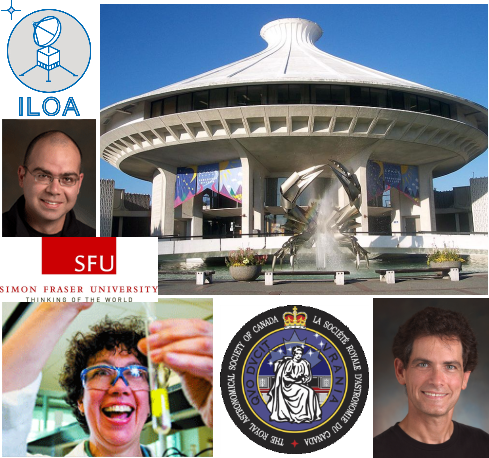 A Galaxy Forum-related event, sponsored by ILOA and in partnership with the Vancouver Centre of the Royal Astronomical Society of Canada and the H.R. Macmillan Space Centre. Neil Turok, Director of Cosmology at the Perimeter Institute for Theoretical Physics in Waterloo, Ontario, Canada. Dr. Turok reveals two models: one in which the Universe began at the Bang, and the other in which the Bang was a violent event in a pre-existing Universe. The competition between these models lies at the heart of many deep questions about the Universe, and about our ultimate ability to understand it. Dr. Turok has worked with Dr. Stephen Hawking and also founded the African Institute for Mathematical Sciences. He co-authored the popular science book “Endless Universe: Beyond the Big Bang” with Princeton physicist Dr. Paul Steinhardt.